Zip lines are exploding in popularity across America, with the number of these high-flying thrill rides soaring from 10 in 2001 to more than 200 today. 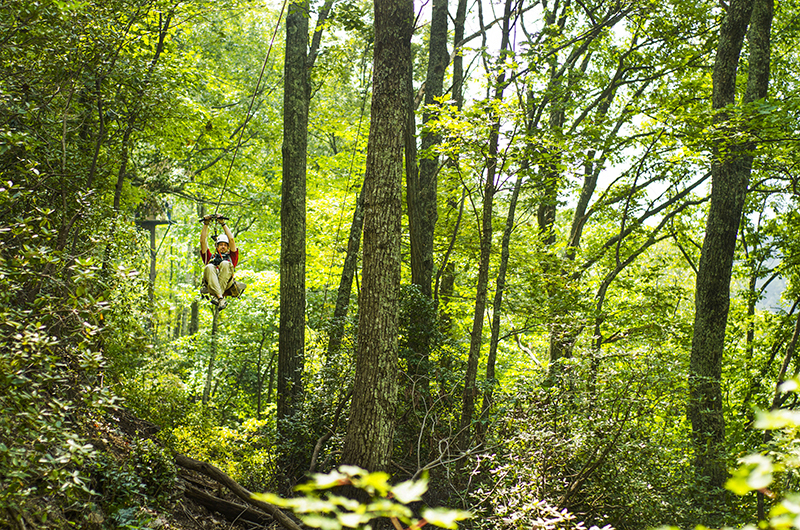 Unique among zip lines is a new 1¼-mile extreme course called The Gorge located on 125 wild acres just off Interstate 26 near Saluda, N.C. Billed as the steepest, fastest zip line canopy tour in the US, The Gorge launches visitors on a heart-racing descent into the gorge of the world famous Green River. The 11 sections culminate in a section co-owner Tim Bell calls "The Star Wars Zip," due to its similarity to the scene of racing through giant trees featured in The Return of the Jedi. "You're zooming through trees in a creek bed canyon that suddenly drops out from under you," explains Tim, 33, who opened The Gorge with his wife and business partner Sara Bell. "You are going from the rim of the gorge to the bottom, so you feel like you have accomplished something on this very significant natural feature." 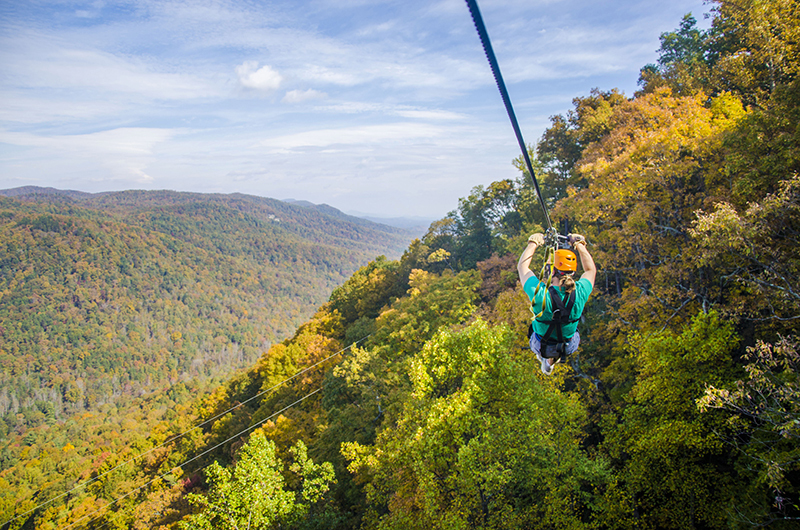 Whereas many zip lines are built around a single long course or traverse from ridge to ridge, The Gorge is a linked series of 11 sections, four of them 1,000 feet long, dropping 1,100 feet from rim to river level. The course also includes three rappels and a sky bridge for a total of 15 elements. And whereas many zip lines use a mechanical braking system that requires visitors to slow their speeds with gloved hands, The Gorge features a hands-free mechanical braking system allowing people to attain speeds of up to 40 mph. That's how the course designers, Challenge Design Innovation of Newland, N.C., were able to create zip lines that drop at a 10 percent grade compared to the usual 6 percent. It's a heart-pounding, high-intensity experience billed as extreme but safe for most people, from kids as young as 10 to active seniors in good physical health. But it's not just the adrenaline rush of zooming through tree tops, plunging down three huge rappels and stepping across a 95-foot "sky bridge" that Tim and Sara are betting will draw visitors. It's the experience of getting up close and personal with huge trees, many of them over 175 years old. The huge poplars, oaks, cucumber magnolias, and maples that hold the circular launch platforms also anchor a rare old growth forest ecosystem that clings to the steep canyon walls just downstream from the whitewater rapids of the world-famous Green River Narrows. "We've talked to a few biologists who really want a catalogue of this property because it's so unique and so untouched and has the old growth trees on it," Tim says. Before building the first tower or platform for The Gorge, the Bells hired tree specialists with Arbor Source of Greenville, S.C., to inspect, prune and qualify the trees that are home to the course's launch and landing zones. The 18,000-acre state-owned Green River Game lands is visible from varied angles to visitors of all ages who tackle The Gorge. It's a place of deep rugged ravines strewn with giant boulders, a slice of primordial Southern Appalachian forests long overlooked, then preserved and treasured due to its rugged terrain and, until now, inaccessibility. Just seeing the Green River Narrows requires off-trail hiking and bouldering skills – unless you are one of the elite class V kayakers like Tim and Sara. Adventurous parents of two young children, the couple met at Brevard College where they both earned degrees in wilderness leadership and experiential education. In 2006, Sara founded Green River Adventures, which specializes in kayak instruction and inflatable kayak trips on the Green River. Recently the company added a 200-foot waterfall rappel on Big Bradley Fall a short distance from The Gorge outpost. The nearby mountain town of Saluda is known for its arts, restaurants, bed and breakfast inns and other secluded getaways. With The Gorge joining Green River Adventures as an attraction, "we hope that will extend the tourism season for Saluda and encourage visitors to stay for multiple days in the area," Sara says. Saluda has long been a popular retreat due to its fresh mountain air, cool summer temperatures, abundant nature, arts and mountain views. The town is also famous for the nearby Saluda Grade, the steepest standard-gauge mainline railway grade in the United States. "Saluda is a steep place – The Saluda grade, the Narrows, and mountain roads that bring the road bikers up here from Greenville," Tim says. "Now Saluda has the steepest zip line in the US."